All marketing degrees at LSBU are accredited by the Chartered Institute of Marketing (CIM) and the University is recognised as a CIM Gateway, which means that course content clearly and closely maps to CIM expectations and the professional standards of today’s marketing industry. On the 26 November LSBU held their first marketing club event in conjunction with CIM, demonstrating this growing relationship. The club will hold three practitioner workshop events annually, bringing together equal numbers of LSBU students and marketing professionals (CIM members), to work together around emerging issues in marketing. This allows students to develop their ideas in an industry setting, to network, and to benchmark their own employability. “It was an interesting and fun evening for all. Marketing clubs are a great example of how university students can really develop their practical and real-world experience by interacting with agencies and other practitioners already working in the industry. 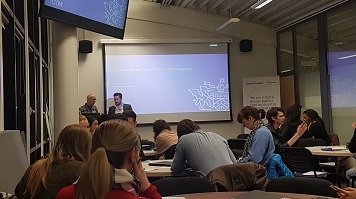 ”this was an initiative we left students of LSBU to organise, and they’ve done a really great job of working with CIM, the speaker, booking all of the spaces, along with pre and post-event communications to deliver a great launch for the LSBU/CIM Marketing Club. In my opinion, the event has been a real success, and provided real value to our marketing students.” Delegates thought so too, rating the event excellent overall. The next event will take place in February, touching upon digital promotion and online branding, along with the importance of brand loyalty, run by the Brandmovers agency. Then finally, to bring the series for 2017/2018 academic period to a close. The final session will focus on new product development. This session will explore how experience of a product in use can quickly suggest ways to build product improvements that lead to next-generation innovations. To find out more, please visit the CIM events page.